The Lihue Airport (LIH) is situated 1.5 miles east of Lihue, on the eastern side of Kauai. Lihue airport is mostly un-walled, and the check in is completely outside. 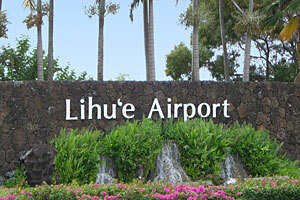 The (LIH) airport does not serve as a major hub for any airlines. Although, numerous inter-island flights are available daily, 7 days per week. The airport is the primary gateway to Kauai for visitors (mainly tourists). The airport services inter-island commercial flights and overseas domestic service. Lihue Airport is composed of two main runways and a helicopter landing pad. LIH Airport provides commuter/air taxi and general aviation operations, including helicopter operations. The passenger terminal is served by a one-way loop road branching off Ahukini Road and encircling a public parking lot. The remaining airport facilities are served by Ahukini Road. After deplaning in Kauai, enter the passenger terminal and proceed to the baggage claim. 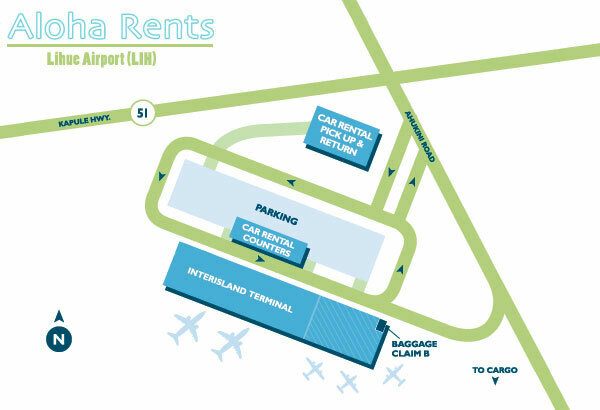 Claim your bags and proceed to the car rental company booths located outside and directly across the street. Locate the car rental company which was chosen for your particular needs. Upon completing the rental car agreement you should go directly behind the car rental booths and board the shuttle bus which will take you to the car rental lots. The first stop houses the majority of the lots. The Thrifty Car Rental pick-up location is another 5 minutes further at 3120 Oihana Street. Using us for your next Kauai car rental saves you money.